ARRIRAW recording bandwidth from multiple ALEXA Mini cameras. One of the ALEXA Mini’s design principles is to reduce weight by avoiding unnecessary items in and around the camera. The main design concept is for the sensor carrier in the center of the camera to act as a hub, to which are attached the camera body, the lens mount and all accessories. In order to extend that concept, a versatile cage has been created to provide an external support structure with multiple components that can be used and combined flexibly. Due to the symmetrical design of the ALEXA Mini, accessory plates can be positioned on the top as well as the bottom of the camera – in fact the sensor image can be flipped and the camera can easily be used upside-down. The cornerstones of the cage are the two accessory plates MAP-1 and MAP-2. MAP-1 is a lightweight and minimalistic plate that provides centered 1/4-20” and 3/8-16” mounting points. MAP-2 is a larger accessory plate with more mounting points and 15 mm LWS rod support that allows the rods to run through the plate. ALEXA Mini can be equipped with a revolutionary multi-viewfinder that makes life incredibly easy for single-operator users, combining a high resolution OLED eyepiece with a fold-away LCD monitor. ALEXA Mini labeled MVF-1 (AMIRA EVF) and 75cm viewfinder cable with connector for ALEXA Mini EVF port. The MVB-1 contains all necessary rods and brackets to mount an MVF-1 viewfinder to the camera via MAP-2. MVB-1 combines dual 15 mm LWS rods, a sliding bracket and a cross-pipe mount to create a sturdy viewfinder mount that allows the viewfinder to be moved in all directions. The RMB-3 is the Swiss Army knife of the ALEXA Mini cage and can be used very flexibly in a variety of ways. RMB-3 can be used on MAP-1 and MAP-2 to hold a single 19 mm or 15 mm LWS rod (with reduction insert) and can be mounted to various interface options on the top or sides of the MAP-1 and MAP-2 plates. RMB-3 can also be used in combination with MAP-1, the viewfinder cross-pipe mount and the CCH-2 or CTH-1 handles to create a lightweight top plate with viewfinder and top handle support. A cage side bracket that features 1/4-20” and 3/8-16” accessory threads and an ARRI standard rosette, the MSB-1 can be mounted to the side of any MAP-1 / MAP-2 configuration. The rosette interface of the MSB-1 is placed asymmetrically so that it can be mounted with the rosette close to the top or close to the bottom, providing flexible options when attaching handles or handle extensions. The BPA-4 is a spacer plate that mounts to MAP-2 in order to interface with standard cine-style bridge plates such as the BP-8 or BP-9. The combination of MAP-2, BPA-4, BP-8 and a dovetail base plate provides 19 mm cine-style long lens support and allows even large zoom lenses to be used with the ALEXA Mini. The CSP-1 shoulder pad clamps onto 15 mm LWS rods either in front of or behind the base plate, to achieve the best possible balance on the shoulder. With CSP-1 attached, the camera rig can be safely put down on a flat surface. The battery plate allows industry-standard battery mounts such as V-mount and Gold Mount to be fitted to 15 mm LWS rods. The battery plate can be offset in order to clear the rear memory card slots or to optimize balance. Battery adapter plate that is part of the cage and attaches to the side of the camera. The plate provides IDX and AB compatible mounting points for battery adapters like the Bebob V-Mount adapter. BAP-2 requires either a MAP-1 or MAP-2 to be mounted to the top and the bottom of the camera and attaches to the same interface as MSB-1. BAP-2 replicates the interface so that MSB-1 can be mounted on top. Battery adapter for V-Lock batteries with fixed cable and straight connector to the camera. The adapter has two 2-pin lemo sockets to power accessories which serve unregulated battery power. The adapter is made out of black anodized aluminum, very rugged and provides a very tight seating of the battery. The battery adapter requires either BAP-1 or BAP-2 or another battery adapter with IDX mounting points. The battery adapter will be provided by Bebob exclusively for ARRI. Software Update Package 2.6 (SUP) now available! We highly recommend installing this free-of-charge update at your earliest convenience to further enhance stability and reliability of the ALEXA Mini. What was ARRI’s rationale when creating the ALEXA Mini? One of our customers’ primary requests was for a compact and lightweight camera that would complement the ALEXA camera system. These requests were mainly driven by workflow or grading issues when having to integrate footage from 3rd party cameras with the material shot on ALEXA, but also by the desire to have an equally easy-to-use and reliable camera as the ALEXA. In addition, operators of handheld gimbals and multicopters suggested to us that the majority of their customers would be interested in using an ALEXA on such rigs, which wasn’t really practical with our main unit cameras. Who do you see as the potential users? We expect the camera to be used by everybody who relies on ALEXA as a main camera but struggles with the form factor and weight for certain applications. Crews working on ALEXA-based productions will use the ALEXA Mini in tight environments, on cranes or special rigs, or as a handheld camera. Other users will include individuals working with gimbals and multicopters, or underwater, who want to take their craft to the next level and open up new opportunities on higher-end productions. What is the price-point of the camera? Prices for the ALEXA Mini start at EUR 32,500 – body only, without lens mount or viewfinder. ARRIRAW and 4:3 capabilities will be available as license upgrades for EUR 2,950 each, following a software update later in 2015. The complete list of prices will be available through local ARRI partners when we start to accept orders in March. Is the lens mount included in the price? No. There are various lens mount options, so these must be purchased in addition to the body. What lens mounts are available? For the ALEXA Mini we have developed a super-lightweight titanium PL mount with an integrated L-Bus interface that allows the daisy-chaining of up to three cforce lens-motors directly from the camera, without any need for an external motor controller. In addition, all AMIRA lens mounts – the EF mount and the B4 and steel PL mounts with Hirose connector – will work on the ALEXA Mini as well, and can be purchased separately. What viewfinder options are available? Can the ALEXA Mini be controlled without an ARRI EVF? There are many options for controlling the ALEXA Mini: first of all the camera supports the MVF-1, which is known from the AMIRA and incorporates a flip-out screen that can be used to control and monitor the camera. For the ALEXA Mini we anticipated that people would have to plug and unplug the viewfinder cable quite often, so we incorporated a new military-grade connector on the camera, which is rugged and environmentally protected. What codecs and resolutions are available? At release the camera will be able to record all the typical ARRI ProRes flavors, up to ProRes 4444 XQ in 16:9 HD, 2K Cine, 3.2K and 4K UHD. 4:3 with anamorphic de-squeeze as well as internal ARRIRAW recording to CFast 2.0 cards up to 30 fps and support for external recorders will become available through upgrades during 2015. The ALEXA Mini will record in-camera ProRes 4444 4K UHD up to 60 fps to CFast 2.0 cards, based on the same ALEV III sensor that is used in ALEXA and AMIRA. Is ARRIRAW support possible in the future? ARRIRAW recording is planned as a software license for EUR 2,950 and will be available later in 2015. It will enable internal recording of uncompressed ARRIRAW to CFast 2.0 cards at frame rates up to 30 fps. Not only is ARRI collaborating with CODEX to ensure that the ARRIRAW workflow remains streamlined and straightforward, but also CODEX will offer a new external recorder that can record max. 120 fps of uncompressed 2.8K ARRIRAW per camera, up to a combined max. total of 360 fps from up to four ALEXA Minis. What are the slow motion frame rates on offer? 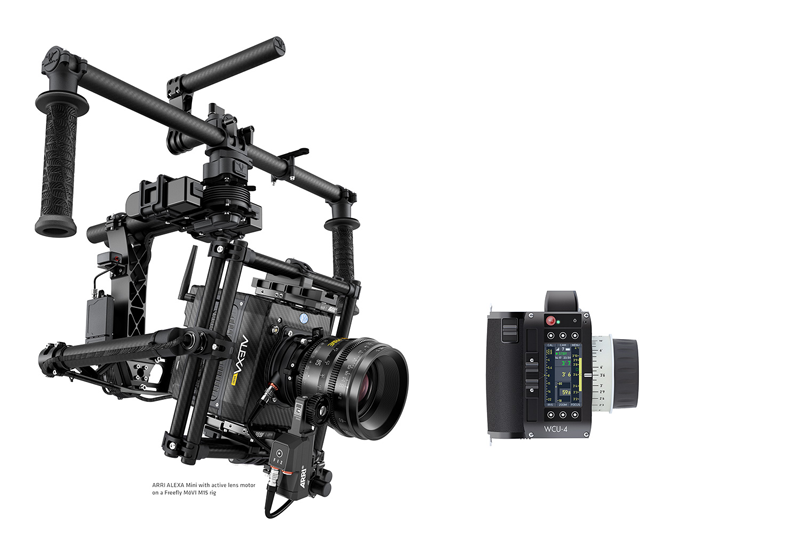 The camera will support shooting at 200 fps in HD and 2K Cine up to ProRes 4444. With the external CODEX recorder the camera will be able to record up to 120 fps uncompressed ARRIRAW 2.8K. Which sensor is being used? The sensor of the ALEXA Mini is the same ALEV III sensor as used in other ALEXA models and in the AMIRA. It offers the same frame rates as the AMIRA sensor but also supports a 4:3 recording mode, like ALEXA. At regular speeds the power draw of the camera is below 50 W and increases to around 70 W depending on environmental conditions, codec and frame rate. What are the audio features – can XLR and Phantom power be used? The camera has a stereo symmetric line-level input. It uses a Lemo connector due to the size and does not supply Phantom power. What is included and what are the optional extras? The camera is purchased body-only and the lens mount of choice must be bought separately. Other optional extras include the MVF-1 viewfinder, LCD control panel, base plate adapters, cage, cforce lens motors and WCU-4 hand unit. What is the weight of the camera? The weight of the camera is around 2.3 kg (5 lbs.) including lens mount and built-in motorized ND filters. Does the ALEXA Mini replace the ALEXA M? ARRI will continue to offer the ALEXA XT M as it may still be preferable over the Mini to some users due to the higher ARRIRAW frame rates, or in situations (e.g. aerial shoots) when the capacity of the Mini’s internal CFast 2.0 cards is too limiting. How does the ALEXA Mini compare to the ALEXA XT? The ALEXA Mini’s design is focused on a compact and lightweight form factor, which is in many respects a compromise compared to our main unit cameras. Our goal for the ALEXA Mini was to provide a very flexible companion camera that will work well alongside our bigger cameras and complement them. The ALEXA XT still has many advantages over the ALEXA Mini and remains the preferred choice for a main unit camera in our view. How does the ALEXA Mini compare to the AMIRA? The AMIRA is optimized in ergonomics and functionality for single operators or small crews working on all kinds of documentary-style productions. The ALEXA Mini is ideal for applications where size, weight and flexible rigging are crucial, but other functions like audio recording are less important. Will Open Gate be supported? We are currently working hard to get the ALEXA Mini released and out the door. As of yet we have not tested whether or not Open Gate will be possible; we intend to look into this as soon as possible, but for now we have no announcement about Open Gate plans for the ALEXA Mini. Will video streaming be available? Video streaming directly from the ALEXA Mini is not going to be possible as it would require a H.264 encoder chip, which does not fit in the camera. What power outputs are there? The ALEXA Mini does not have any dedicated power outputs. However, the camera provides unregulated battery power from the Ext connector, which is switched on and off with the camera. Will 50 Mbit MPEG-2 MXF recording be possible, like it is with the AMIRA? There is no current plan to support MPEG-2 MXF recording with the ALEXA Mini. How do you mount batteries onto the ALEXA Mini? 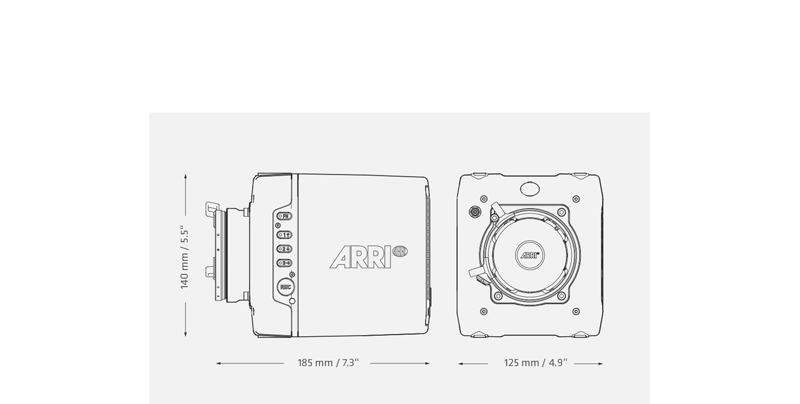 ARRI will offer a battery plate that can be mounted onto 15 mm rods and that supports different battery adapters. It will also be possible to put Velcro on the camera body to hold a V-lock or AB-plate. Are the electronics encapsulated like on the other ARRI cameras? The ALEXA Mini is actually built around an isolated cooling channel, so dust and humidity never come into contact with the sensor or electronics. Do I have to turn the camera into service for the 4:3 or ARRIRAW upgrade? The camera comes with a pre-calibrated 4:3 sensor, so customers can enable 4:3 mode themselves by installing the appropriate software upgrade and license. How will ARRIRAW be recorded? Will it work with a standard reader? The file system on the CFast 2.0 cards will stay the same as for ProRes and you will be able to mix ProRes and ARRIRAW on the same card. ARRIRAW will be recorded to MXF files that are supported by the ARRIRAW toolkit; there will also be a tool that can unpack the MXF into individual files. Naturally CODEX will support the MXF files, so ARRIRAW recording with the Mini will fit seamlessly into existing CODEX workflows using ALEXA XT. What is the noise level of the camera? The ALEXA Mini is built around a cooling channel and has larger fans that can turn slower, so it is very quiet. 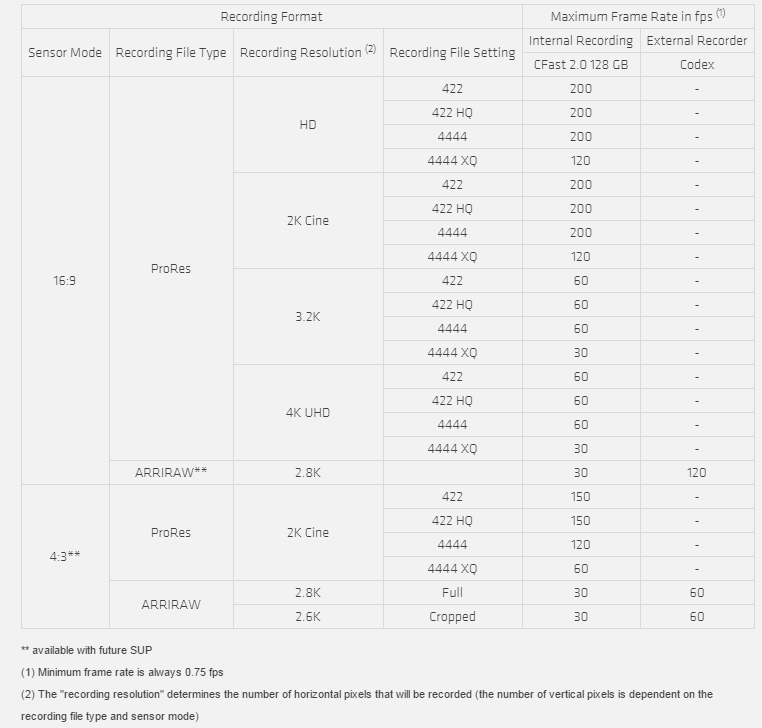 At standard frame rates the noise level is below 20 dB/A. What are the audio capabilities? The camera has a 5 pin Lemo plug at the front, which provides two symmetric line-in pairs and a common ground.